China have three representatives in all doubles department but with none in the singles, it’s infrequent event to happen. On the contrary, host India is represented by two players in singles discipline. Interesting fact: this is the first time home players reach the final on their homeground Superseries tournametn since its inception in the 2011 edition. Looks like Japanese top-seed are favourites to grab their second SS title after the Japan Open last year. Luo Twins have had no significant achievements so far and are quite beatable by their rivals; maybe it’s time to prove that they are a reliable pairing to capture victory. Top seed meets second seed. There has been tremendous improvement by the young Chinese combination and they have bright prospects to nail their maiden Superseries title but the vastly experienced Fischer/Pedersen may go against the odds to score first ever winning over Liu/Bao. The Chinese Mens Doubles seem unconvincing en route to the final whilst Conrad/Kolding confirm their fast development lately by overcoming their seniors Boe/Mogensen yesterday. Unless the Chinese pair significantly minimize their errors seen in the previous rounds, the Danish duo has a big opportunity to top the podium. Two former world junior champions; new world #1 Nehwal has slight advantage to grab her first Superseries on her homeground. There are worries about Intanon’s fitness levels after battling through a gruelling match against Marin in yesterday,’s semifnal. 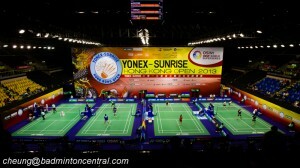 We hope it will not be an anti-climatic final here after the super duel Marin against Intanon in yeterday’s semifinal. The close and exciting final contest as expected from these two players who met couple weeks ago in Basel. In the semifinal, Srikanth showed his signature game-plan, tight net-shot combined with hard attacking smashes and outwitted Xue Song making Xue run corner to corner. Against the tall Axelsen, he may need to implement different tactics.